The Sun Dragon spawned nine lesser dragons which devoured their parent for the power the elder possessed. These young dragons fought for choice bits of the Sun Dragon, but each only managed to eat a portion, thus giving them specific powers. Over time, these foul dragons were hunted down and slain by heroes of old. When each body rotted away, nothing remained save for nine Jewels - each the lens of a dragon's left eye. These Nine Eyes, or Jewels, form the basis for all magic in the world. The Haven Series is a fantasy epic about the Nine Jewels of Power, each of which represents a different form of magic. The Red Jewel, known as Sang, gives the wielder power over Blood Magic. The Blue, named Lavatis, can call the Rainbow and rules the Sky. Amber Magic is a short introductory book in this epic series of fantasy novels by best-selling author B. V. Larson. 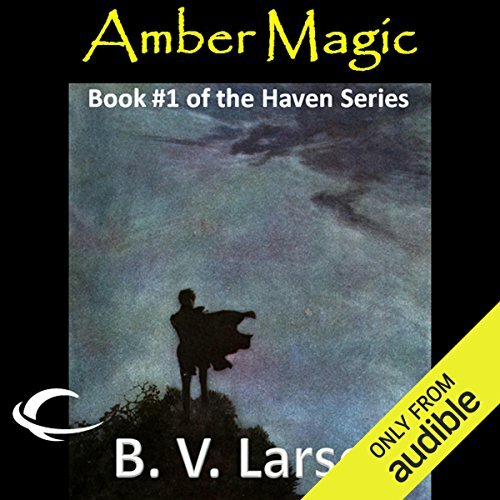 ©2010 B.V. Larson (P)2012 Audible, Inc.
What did you like best about Amber Magic? What did you like least? I liked the characters, I liked the story. I didn't like the way it ended. It seemed cut off and only half finished. If you’ve listened to books by B. V. Larson before, how does this one compare? The other books I've listened to were full of action, and adventure. This one seemed to move very slowly and almost nothing happened. Nothing. I like the way he reads. Was Amber Magic worth the listening time? Everything from B.V. Larson is worth listening to (At least once). I've listened to his other series Undying Mercenaries and Star Force. I enjoyed them greatly. Enjoyed so much that I thought I would follow him from the Sci-Fi worlds and try his Fantasy worlds. Though I'm a huge Fantasy fan as well, I'll probably just finish the Haven series and go back to his Sci-Fi stuff. I'll look to other authors for my Fantasy fix. With the story sporting both B.V. Larson and Mark Boyett, I've wanted to purchase this novel for close to a year but kept putting it off hoping that the following books in the series would eventually also be offered in the Whispersync format. I decided not to wait any longer and purchased this first in the Haven series. Most of the novel seems to be backstory for the follow-on series but, even so, it was interesting learning about all the various characters that inhabit this realm. I look forward to book 2; hopefully, in Whispersync format by the time I'm ready. ...apparently he should stick to sci-fi. This one was so boring I couldn't finish it. Good narrator though. This story showed a lot of potential. I'm going to get the next book in the series. That having been said, the story takes way too long to get rolling. You basically don't get to the point of the plot until at least half the way through. This is not helped by the nature of the narrator's voice. He was putting me to sleep, it was a struggle. He had a decent variance in voice from character to character, but the delivery was that of a bedtime story. Seriously, it was delivered exactly the way I used to read stories to my nieces to get them to go to sleep. This is the first of B. V. Larson's work that I have listened to. I have several of the sci-fi end of their writing in my libray, but I went with this one first. More energy in the narrator's voice. Yes. This is a pretty short book and it did eventually capture my interest, but that took most of the book to happen. Slow start but a fantastic story! Great read! Love the characters and the story. At first a bit slow but a gripping story well painted by both Author and Narrator. I gave up on fantasy when I left my teens. B V is such a wonderful author that I thought to give it a go. Struggled reading it myself and stopped early in. The book builds the story slowly. I then picked it up on audio. I read to my kids mind you, but the narrator here was top notch. Felt like I was IN the story. Couldn't stop it once I started. Rich story once you stay with it and traditional fantasy lovers will eat it up is my guess. Going to buy the next audio book right NOW. Love your work BV! Keep going! just rubbish, no idea what the author was thinking. this book is all over the map. This audio book is good, but it is extremely short. After lessening to it I fell more like it was the first half to a longer book than a book in it own right. Retained my attention, but not Larson's best work. Apparent pacing & character development flaws. Still good enough to check out the next two Haven books to see if these minor qualms get sorted out. Would you try another book from B. V. Larson and/or Mark Boyett? What aspect of Mark Boyett’s performance would you have changed? I found the book boring, I do like his Star Force series.